As a firearm rights and constitutional advocate, I have an immense interest and passion for defending cases involving gun rights. Over the past 17 years I have gathered a significant amount of experience in defending clients facing gun charges from carrying a concealed weapon to murder one. My legal defense services can also help with simpler cases such as wrongful hunting violations, wrongful discharge and other firearm related crimes. 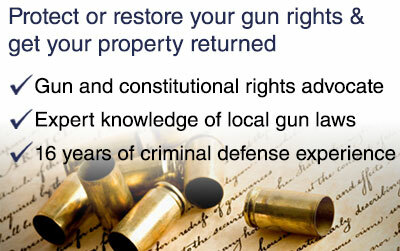 I recognize the detailed approach which is necessary to defend clients facing serious weapons charges. In many cases, it may just be a matter of a concealed pistol license that has lapsed, resulting in wrongful possession charges. Regardless of the nature of gun charge you are facing, I will work with you to develop a strategy tailored to your situation. Have you lost your gun rights? As an authorized concealed weapons class instructor I am a firm believer of a person’s right to defend themselves. Sadly most self-defense cases involve citizens with concealed weapons licenses who were merely defending their own life or the life of others.